What is the South African Truth and Reconciliation Commission? In 1993, leaders in South Africa successfully completed a long series of negotiations that would end apartheid and set in motion the institutions of majority democracy. The Interim Constitution that resulted from the negotiations ends with a postamble that articulates “a need for understanding but not vengeance, a need for reparation but not retaliation, a need for ubuntu but not victimization.” The main voice of the liberation struggle, the African National Congress, had agreed that a selective amnesty would be granted with respect to the brutal crimes committed under apartheid as part of the negotiation process. Ubuntu is a term found in the Nguni-based languages of Southern Africa and refers to “humaneness” and community interdependence. By including it in the new constitution, the new leaders of Africa presented the amnesty in the spirit of an overall call for community-building in the new country. Archbishop Desmond Tutu, who chaired the TRC, associates the African concept of ubuntu with “restorative,” community-based justice as opposed to prosecutorial, retributive justice. In 1995, the new democratically elected parliament enacted the National Unity and Reconciliation Act, which detailed the terms of the selective amnesty and called for the creation of a Truth and Reconciliation Commission. Under the guidelines of the Act, individuals may be eligible for amnesty if they meet three basic conditions. They must provide “full disclosure” of all knowledge pertaining to “gross human rights violations,” explain a political objective for their involvement in such violations, and demonstrate a proportional relationship between the political objective and the violations. In line with agreements made during the negotiations, members of the apartheid regime as well as members of the liberation groups would have to apply for amnesty or face prosecution. Where did South Africa get the idea to have a truth and reconciliation commission? Truth commissions are not a new idea. Latin American countries emerging out of long periods of authoritarian rule, such as Chile and Argentina, developed truth commissions or investigative commissions in order to expose and condemn the mass violence committed under outgoing military regimes. The new governments in these countries generally were unable to consider prosecution for such abuses because the outgoing military was still powerful and capable of staging coups. Many Latin American leaders and scholars, however, came to see that truth could be a very strong tool with which to judge the past. Much of Latin America’s violence, such as “disappearances” and tortures, was denied and hidden by the regimes. As such, official acknowledgment of these violations and details about the crimes often proved very valuable to the families of victims. South African leaders held conferences in 1994 and 1995, where they met with leaders from Latin America, and Eastern Europe to discuss lessons they learned through their own experiences with the process of coming to terms with a legacy of violence. Leaders in South Africa also held numerous public debates and requested input from NGO leaders around the country on how to structure the TRC. It was as a result of public pressure from NGOs, for instance, that the legislators behind the TRC departed from the original plan for in camera hearings and instead held hearings that were very accessible to the public. South Africa’s Truth and Reconciliation Commission was the first to hold such open televised hearings, and it was also the first to link truth-telling to the threat of prosecution. As a result, South Africa presented the world with the dramatic spectacle of televised police confessions to involvement in brutal killings. It also presented the diverse voices of thousands of victims describing what it felt like to experience the worst brutalities of apartheid. Why is the TRC so controversial? The TRC has been very controversial in South Africa and among human rights advocates outside of South Africa. The most visible controversy surrounding the TRC has to do with the amnesty process. Ntsiki Biko, the widow of Steve Biko, challenged the TRC in court on the grounds that the amnesty was a denial of her right to prosecution and civil redress. In 1996, the Constitutional Court (South Africaâs version of the Supreme Court) upheld the TRC enabling legislation against this challenge, maintaining that such individual rights were limited by the constitutional postamble and its call for “national unity and reconciliation.” This case drew a great deal of attention from the western press and human rights groups because it cast the drama of the TRC and the stakes of amnesty in sharp relief. The TRC would ask victims of terrible crimes to accept a process of forgiveness for those who had committed them on the principle of “national reconciliation.” This is especially tricky as it invokes a national community that had never really existed. When the TRC was designed, South African leaders expressed the hope that the process of telling their stories would help victims to move on with their lives. They worked to construct a friendly environment for the victims and hired trained therapists and spiritual leaders to walk victims through the process and to comfort them if it became painful. However, mental health professionals have often been very critical of the TRC, and have argued that it encouraged people to open up old wounds without making any provisions for long term mental health care. This issue was exacerbated by a misunderstanding connected to the TRC about reparations. The TRC was never empowered to pay reparations. However, it had a committee that was to work on recommending reparations. Many victims assumed that the TRC would be able to help them much more than it was able to and this perception was possibly influenced by an optimism at the TRC about reparations that was not to last. The TRC recently announced that it will pay only 3,000 Rand to 16,700 identified victims. Finally, the TRC was controversial because the crimes of the way it presented the truth. First, the TRC dealt with the excesses of apartheid, rather than apartheid itself. As a result, people such as Professor Mahmood Mamdani have argued that the truth of the TRC is misleading. It presents the truth about apartheid as the extreme violence of torture and murders, when the day to day brutalities, such as forced removals, contributed to the most stubborn and tragic legacy of apartheid, the terrible poverty and gross inequality that persists to this day in the country. Second, the vague definition of “gross human rights violation” meant that violence committed by the ANC and other liberation movements was given the same label as violence committed by the state. Although the ANC was instrumental in creating the TRC, this issue did cause the ANC to contest some of the findings of the TRC as stated in the report. What resulted from the TRC? Despite these controversies, even many of the TRC’s critics will say that they are glad that South Africa had a TRC. Its proceedings helped to shed light on key controversial issues in South Africa’s history of struggle. For example, in 1997, the TRC released details of the 1992 Steyn Report, which showed that de Klerk knew about the training of a “third force,” a network of security and ex-security operatives acting with right-wing Inkatha Freedom Party elements to foment violence, long before he relinquished power. This detail and other confessions pertaining to “third force” activities helped to show that the state was instigating much of the so-called “black on black” violence prior to the transition. The TRC also conducted a special investigation into South Africa’s Chemical and Biological Warfare Programme. The investigation uncovered that under the leadership of Dr. Wouter Basson, and with the sponsorship of the military, this program was responsible for numerous individual poisonings with toxins such as anthrax, paroaxon, and botulism. The commission conducted special hearings on South African institutions, such as the media, businesses, and legal institutions, to determine the extent and nature of their complicity with apartheid. 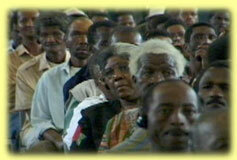 The TRC also set in motion and facilitated a large-scale public debate on how to come to terms with its violent past. In the process, it gathered together many voices that might not otherwise have been heard at all, let alone placed in the same room with their former enemies. In 1998, a survey conducted for Business Day (a newspaper) by ACNielsen Market Research Africa, attracted a lot of negative attention for the TRC by claiming that only 18% of those surveyed did not feel the commission would worsen race relations. However, few people involved with the TRC expected the truths revealed in the process to lead directly to reconciliation. As Mary Burton states in the film, the success or failure of the TRC cannot be judged by the feelings at the moment and is rather the beginning of a long process of dealing with the legacy of South Africa’s brutal past. Bronwyn Leebaw is a doctoral candidate in the Department of Political Science at the University of California Berkeley, where She is also a Research Assistant at the Human Rights Center.